The 11th RailTech Europe Fair will take place from 28th to 30th March 2017 in Utrecht, the Netherlands. Participation in RailTech Europe 2017 gives Amberg Technologies the unique opportunity to exchange and network with customers, partners, colleagues and suppliers. The event is also an exclusive opportunity to celebrate innovation within the railway industry. 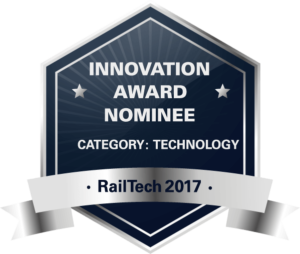 The Amberg IMS 5000 system is nominated for the “RailTech Innovation Award” in the “Technology” category. Amberg are delighted that they have made it into the shortlist and are delighted to present the revolutionary Amberg IMS 5000 track gauge system. With the Amberg IMS 5000, the GRP 5000 system, which is used for measurement of the space and the population, is now also being expanded with the same IMU technology. This provides users with a new dimension of measurement performance while providing high accuracy. The jury has also nominated 18 candidates for the “Public RailTech Innovation Award”, including the Amberg IMS 5000 system. Original article © Amberg Technologies. FOR ALL THE LATEST INFORMATION, NEWS, IMAGES, VIDEOS AND DOCUMENTS FROM AMBERG TECHNOLOGIES PLEASE CLICK HERE.